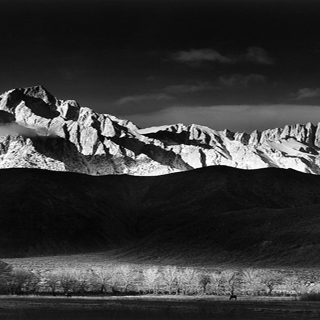 Worth began serious photography in 1949, and worked as an assistant to Ansel Adams from 1956 to 1960. He began teaching photography in the Art Department of San Francisco State University in 1962. His early life was dedicated to music, and he attended the Juilliard School of Music and the Manhattan School of Music where he received the Bachelor of Music degree (1949) and the Master of Music degree (1951) in piano and composition. Worth's childhood on an Iowa farm sparked a life-long interest in horticulture and he designed and maintained a large subtropical garden at his home near San Francisco. Most of his photographs use plants as their subject matter. He has traveled widely in order to photograph. Worth's photographs — made, generally, with large format cameras — have an incisive clarity and quiet meditative mood. Many images involve enormous spaces, and often use the transformative power of fog, mist, and other atmospheric conditions. Worth was awarded the Guggenheim Fellowship in 1974 and received an appointment from the National Endowment for the Arts in 1980. His work has been exhibited in more than 50 solo exhibitions and over 100 group exhibitions. His photographs are owned by the Museum of Modern Art in New York, the San Francisco Museum of Modern Art, The Boston Museum of Fine Art, the Getty Museum, the Chicago Institute of Art, the Australian National Gallery, the Bibliotheque Nationale in Paris, and many other museums.